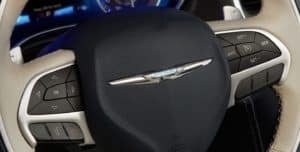 The Chrysler 300 is a powerful family sedan with a bold look on the outside and lots of space and comfort on the inside. It comes with either a V6 or V8 engine and provides a smooth, comfortable ride. While the 300 has the power to get you around, it also features some great technology. Here are some of the amazing tech features on the 2017 Chrysler 300. 2017 brings the newest version of the already impressive Uconnect infotainment system. The 300 comes with an 8.4-inch full-color touch screen and either Uconnect or Uconnect Nav. The base Uconnect comes with Sirius XM radio and Bluetooth streaming audio, with integrated voice command technology. Choose Uconnect Nav to add Sirius Travel Link and Sirius Traffic Plus with five years of service. The upgraded system connects your phone almost instantly, and you can control the screen with pinch and swipe gestures just like a phone. Some of the 300 trims have the option to add the BeatsAudio Premium sound system. This comes with ten speakers, and a dual-voice coil subwoofer mounted in the trunk. The system includes five 3.5-inch mid-range speakers in the rear doors in the instrument panel and four 6×9-inch Beats Audio woofers. You’ll also get a 552-watt amplifier with 12 channels. Stay connected with SiriusXM services. You can add SiriusXM Guardian with Vehicle Finder to help find your vehicle whether you park in a large parking lot or in the city. This service also allows you to send the car commands from your cell phone so you can start it, lock it, or unlock it from almost anywhere. You can even flash the lights or sound the horn remotely whether you need help finding it or want to make sure it is secure. The Send & Go feature allows you to search for locations on your phone and then send them to the built-in navigation system in the car. The 2017 Chrysler 300 also comes with advanced safety technology. You can add driver assist systems such as Lane Sense lane departure warning with lane keep assist and a full-speed forward collision warning system with active braking. There is also a rear cross-path detection system to alert you when something or someone crosses behind you. The adaptive cruise control system includes a stop function that manages the brake and the throttle to help you stay a safe distance from the car in front of you. The 300 comes equipped with two USB ports and an audio jack so you can connect your media device and play your music through the car sound system. There is also a wireless charging pad to make sure your phone stays at full battery and keeps you connected throughout your trip. The advanced technology in the 2017 Chrysler 300 helps to set it apart from other family sedans, so you and your passengers are happy and entertained.